Excellent seller! Very flexible and customer focussed! Can't wait to hear it. Fast shipping!!!!! Thanks! Exactly what I ordered and early! Well packaged. 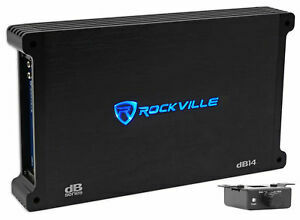 The Rockville 4000 watt amp is a hard hitter. It has great tone that takes that next step down low. My DC 18, series 3 never sounded so good, give it 5 stars all day. Great amp it’s got plenty of power and great sound very impressed. I purchased a amp that said it was 2000 watts RMS and came with a dyno sheet saying it only puts out 1040 watts. Was not powerful enough to power my speakers.